Small business owners will have heard all the rave and buzz about Twitter, and how this microblogging site can help enhance their respective brands. But if you’re not particularly adept at social media, you might be hesitant to dedicate your time and spend all your efforts on something you’re unsure of. Don’t worry; it’s perfectly natural. It is indeed difficult to cut through all the noise and find out what exactly you’re getting from Twitter. How does it help your brand? What are people saying about it? In what ways can you manage the so-called “Twitter sentiment” when you don’t even know what that sentiment is? Below you’ll find a list of Twitter tools to help bring you closer to the answers you’re looking for. These are tools for tracking Twitter sentiment – or how people perceive your brand – in the popular social media site. Twitter Search: It goes without saying that the volume of Tweets that the world transmits every second is huge. 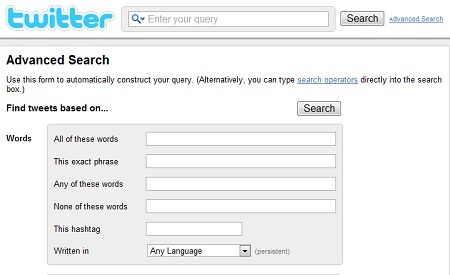 Twitter Search lets you filter those Tweets and find the information you’re looking for. Using the tool’s Advanced Search you can craft your queries and find out what people are saying about your brand. Just type in the word or phrase you want and from there you can find which Tweets contain it. The search can be customized to include only Tweets being transmitted from a specific distance. Moreover, you can create a search for mentions of your brand that include smileys or a particular hashtag. You can then save this customized search and monitor it daily, or even subscribe to it via RSS feeds. 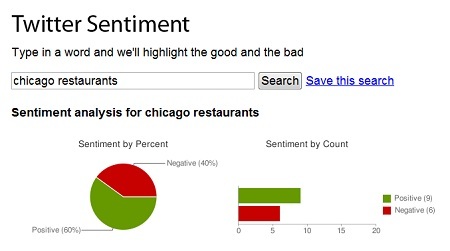 Twitter Sentiment: This useful tool allows you to research Twitter sentiment for your brand, product, or topic. Built on machine learning algorithms, Twitter Sentiment lets you enter a search query, track it, and analyze automatically generated charts that show the positive and negative mentions of your brand, as well as how they’ve fluctuated over time. Not only that; you can also export the Tweets that you have found into a CSV file. Tracking Twitter: Sometimes you just have to look at what others are doing right – and use their example as a model of how to use social media to your advantage. And there’s a tool just for that. With Tracking Twitter, you can track the sentiment of your biggest competitors, or even the biggest and favorite brands out there on Twitter. What are they doing right? This tool shows you just that. Created by an agency called Electric Artists, Tracking Twitter also offers a real-time directory of Twitter feeds that include a number of the biggest brands and the best-managed Twitter accounts. Twitrratr: This tool is built on the need to distinguish negative mentions on Twitter from positive mentions. How does it work? 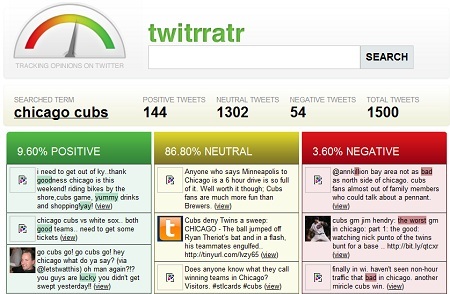 Twitrratr utilizes a list of positive keywords and a list of negative keywords. Once you enter a search query, the tool delivers results that are cross-referenced against its list of adjectives. The results are delivered in three columns: positive, negative, and neutral. It’s very easy to use, and – because you get to see who’s saying what about you – Twitrratr also puts you in a position where you can readily engage with the rest of the Twitter community. Social Mention: This is like Google Alerts, but for Social Media. With Social Mention you can receive daily E-mail alerts on brand mentions – or mentions in social media of whichever keyword you have specified. Not only is this a great tool for monitoring your Twitter sentiment in real-time; it’s also useful for monitoring the engagement activities of your competitor. Tweettronics: This is another easy-to-use brand monitoring tool that allows you to capture what Twitter users are saying about you, your product, or your brand. 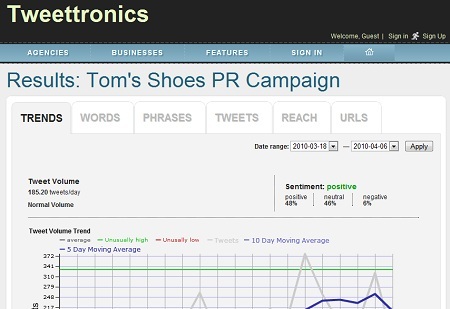 Tweettronics tracks about 6 million users and provides features like advanced search (with daily alerts), preservation of found Tweets, sentiment analysis, downloadable graphs and comparison charts, and capabilities in grouping Twitter mentions by Twitter usage, location, or time. What makes this tool stand out is that you can calculate the influence of your Tweets via estimates tied to the likelihood of your message being read and the likelihood of it being retweeted.